Space Amoeba (1970) – SKREEONK! Oh, film titles. How you are so very confusing in the world of Kaiju Eiga. This time around we have Space Amoeba, or Yog-The Monster From Outer Space. Originally, the Japanese film was entitled Gezora, Ganime, Kamoeba: Decisive Battle! Giant Monsters of the South Seas (ゲゾラ・ガニメ・カメーバ 決戦! 南海の大怪獣 “Gezora Ganime Kameba Kessen! Nankai no Kaijuu. Yowza! Space Amoeba is mostly a rehash of elements we’ve seen before at Toho. Alien life forms have come to conquer the planet and use a human vessel as assistance in carrying out the plan. However, instead of bringing their own monsters as the alien races do in The Mysterians, Ghidorah, the Three Headed Monster, or Godzilla vs Gigan, they simply blow up the size of some Earth animals (more on that later). It is up to a small group of people on the plot’s island to save the day. In spite of being that last original giant monster picture from Toho’s Showa series, Space Amoeba fails to move the needle as much as some of their 50s and 60s movies did. The plot could’ve worked if it had been carried out with a bit more care, but the passe plot was made no more interesting by good acting or special effects. Eiji Tsuburaya was a famous special effects director at Toho, and this was the first kaiju film made after his death. The special effects are pretty hit-and-miss here. In other words, he is missed. The monster with the most combined discussion and screen time is the first to appear, Gezora; he is thought to be a monster god by the inhabitants of the island. Gezora is referred to as both a squid and an octopus in the picture depending upon which audio and subtitles you are referencing, but he mostly reflects the proportions of a squid in my opinion. He isn’t very convincing in his motions with his suit wrinkling and folding unnaturally. His eyes look very fake as well. 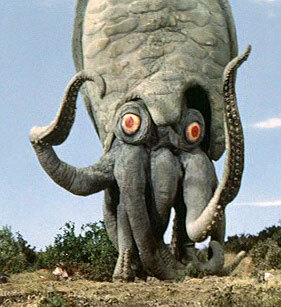 Gezora is a pretty obscure monster even within Toho’s fans, but it’s not without warrant. Ganime is a giant mutated crab, somewhat similar to Toho’s own giant lobster Ebirah that starred in Ebirah, Horror of the Deep (aka Godzilla vs The Sea Monster) and much more recently in Godzilla: Final Wars. Compared to his Showa Ebirah stablemate, I actually think Ganime looks better and more menacing. A pretty well done suit and acceptable movements here. 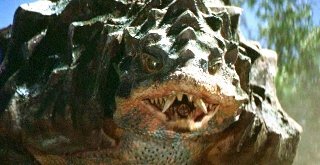 Kamoebas is the third and final monster in the film, a giant turtle. He is probably the best known due to his second appearance in a far more popular and contemporary movie, 2003’s Godzilla: Tokyo SOS. Kamoebas and Ganime actually battle at the end of the movie and plummet into a volcano to their demise (predictably). 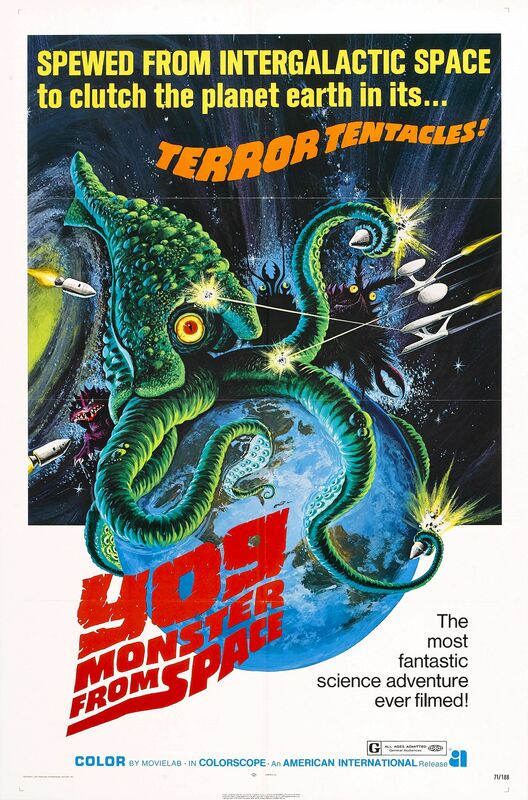 The only real reason to view Space Amoeba is to see some new monster action, because from the standpoint of the plot and acting, you’ve seen it before at Toho many times over. That’s not to say I will give this film a low rating; I’d still rate it a mediocre 5/10, but that’s the most it deserves. 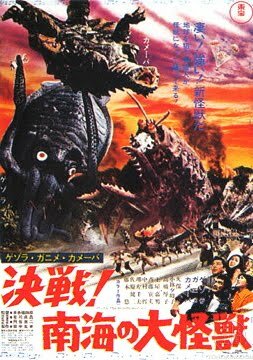 Toho did a plenty of superior monster movies before this one (and some of the Godzilla ones that followed), so this shouldn’t be one of the first ones you seek. This film has one of my favorite US release posters of all time. Headlined as YOG -Monster From Space, this piece of pop culture is fantastic. Click to enlarge. Epic, indeed.